As working moms, it’s pretty much in our blood to put everything on our plates and attempt to get it all done, right? We want to be super moms and show up at class parties. We want to be able to support our families financially. We want to be the best wives ever and keep the spice alive in our marriages. We want to take care of ourselves with regular workouts. We want to feed our families only the best healthiest food possible. Yet, somehow with everything on our plates, we just end up a frazzled mess by the end of the week and want to just lock ourselves in the bathroom away from our families with a bag of cheetos. The thing is, you KNOW there are working moms who have their act together. You see it happening. Plenty of working moms make it to the gym on a regular basis. Your co-workers talk about delicious meals they made their families. One of your besties (also a working mom) even got a massage in a couple weeks ago. And that is what I wanted to talk about. You are definitely not doing anything wrong, per say. 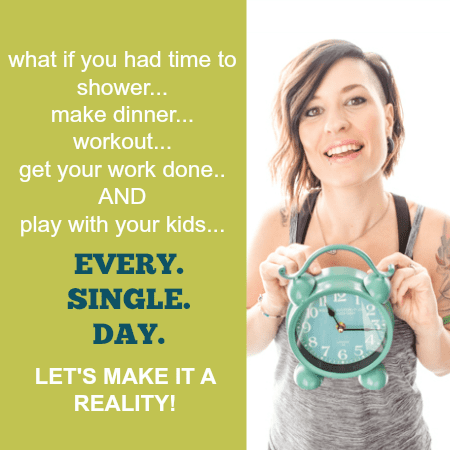 But maybe there are a few things you aren’t doing that would actually make your life so much easier… and YOU could be one of those magical moms who gets everything done. So let’s get right do it. You feel like your life is jam-packed. You feel like there’s no way you could possibly fit more things into your day. You’re go-go-go from the moment you wake up until the second your head hits the pillow. Right? While this may be accurate, I wonder how much time you’re spending doing other unnecessary things. I’m talking mindless browsing on Facebook, binge-watching Netflix shows, and just doing things that aren’t valuable to your life. When I actually paid attention to the time I was spending on everything in my life, I realized how much time I was wasting and could’ve been spending it doing more productive things. Last year, when I did a huge time audit of my life, I came up with an extra THREE HOURS in each day!! This goes back to us trying to be super moms. We want to do it all. Society has told us that we should be able to do it all. So we try as hard as we can and end up losing our sanity in the process. As a working mom, you deserve as much help as you can possibly get. From your kids. From your spouse. From your parents. From your neighbors. From a house-cleaner you hire once a month. Seek help mama! It’s not a sign of weakness. It’s a sign of a smart woman who cares about her health and sanity. Often as busy moms we push off the things we just don’t feel like doing. The cleaning, the working out, the appointments we need to make. 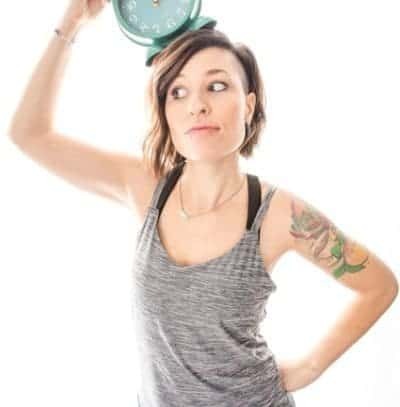 They’re not fun, so we just push them to the end of the list and will get to them “when I have time.” Turns out, there’s really no time that will seem like a good time to work out and it will continue to get pushed off until we actually make it a priority and find a place for it in the schedule. This is another one of those not-fun tasks that end up getting us in a pickle if we don’t do it. Planning out a week’s worth of meals isn’t fun and you tell yourself you’ll just figure it out when you stop at the store after work. Or you’ll just pick something up on the way home from work. So much time ends up being spent making these little stops throughout the week when you could’ve just done it once and been done with it. I only spend 20 minutes each and every week planning out my family’s meals. I have a love/hate relationship with Pinterest. There are so many great ideas on there, aren’t there? But it’s also a huge reminder to myself as a working mom that I just can’t do it all. I try to be “that mom,” but I know better than that, and I know you do too. Sometimes we just have to make a cut somewhere, and homemade party favors for your 1-year-old’s birthday party is probably a great place to start. There’s one more mistake that you’re probably making as a busy working mom. You are most likely not taking time-outs for yourself. You’re not scheduling in the occasional massage. You’re not getting your hair done on a regular basis. You’re not taking the time to get in a nap or a reading session with a good book. Big mistake mama! You work hard, and you deserve these times to recharge! Yikes, are you making any of these mistakes? I know I use to make every single one. Especially that last one. Now I’m a master at taking time for myself, as well as meal-planning, making time for exercise, and letting go! And I’m not afraid to ask for help anymore either.